It was quiet this morning, overcast and cool. The big robust trees that line the streets here in Spokane are in varying stages of autumnal transition. Some are still sporting a full head of deep green, some are already burning red or glowing yellow, while others are Ombre – morphing day by day into shades of pink or orange or gold or maroon. I didn’t have anything pressing here at home to do, so I set out to explore an attraction in my new hometown – the Northwest Museum of Arts & Culture. 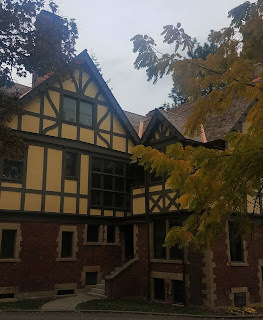 I’ve read up on the museum a bit and have been following their activities on Facebook since we landed in Spokane, so I knew that several new temporary exhibits just rotated in, that a historic home is associated with the museum and I suspected that there must be a store and a café on the grounds, too (I love museum stores and cafes!). Since I didn’t have any time constraints, I decided to try out the bus system for the first time to get there and back. I set out from our house to catch the #33 south toward the museum, waited a few minutes at the tiny triangle-shaped convenience store a couple of blocks down the street, then hopped aboard the green and white bus. Only a few of us were riding – a couple of men, a young mother with two small children, me. Our route took us down the hill, across the river, through the Spokane Falls Community College campus where we picked up a small group of foreign exchange students, then along the curving forested avenue into the city’s historic section. Big stone and brick houses stair-stepped up the hill south of the river, stately trees leaned over the sidewalks, runners trotted underneath. I pulled the cord and disembarked just below the museum and walked a block up the hill. The grounds were peaceful and the grass was dappled with hardwood leaves. I kicked through shallow deposits of pine needles gathered on a path that led to the entrance and found several friendly staff members waiting for patrons. I got my pass and headed downstairs to the galleries. The museum has existed in Spokane in various iterations since 1916. Like so many local historical societies and museums, this one began as a collection of relics and antiquities that the founders thought were interesting – many of the objects sourced from personal and family collections, and thus comprising a fairly narrow historical focus. And, like so many local museums, this one has gone through a number of recreations and re-identifications as the times, social and community interests, personnel and board members, and financial resources changed. In the 1980s and 1990s, new ideas took hold in the field of local history and museums moved more toward diversification and inclusion, education, and collaboration. You can clearly see these ideals today behind the design and programming at the Northwest Museum of Arts & Culture. When I entered the galleries downstairs there were four exhibits – one was focused on women of the Columbia River Plateau tribes, one was a contemporary art exhibit inspired by political activism, the third featured historical items and interpretation about Spokane’s relationship to World War I, and the last was a western photography exhibit from mid-century masters. 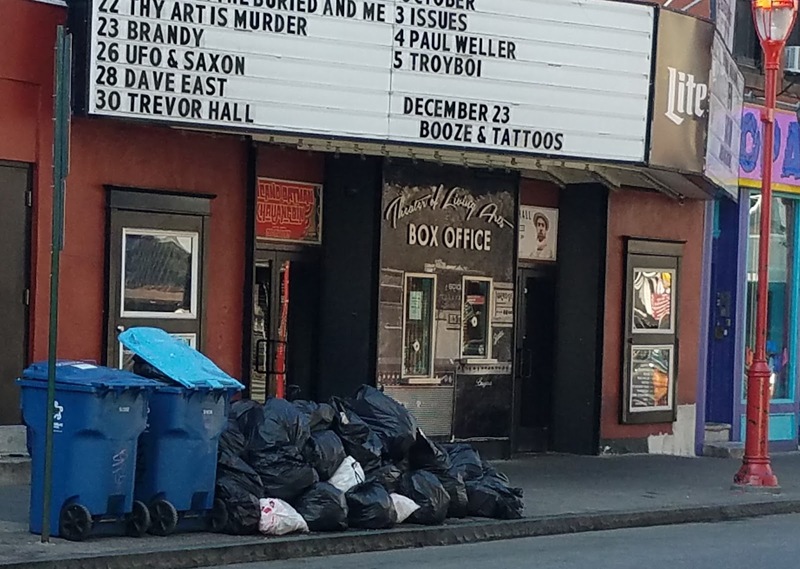 I have spent precious little time since arriving in Spokane learning about the city’s history, so was anxious to pick up anything that might be offered – I like to understand my context. The museum is not a traditional “local history” museum. You won’t find a chronological display of Spokane’s past – from pre-history through modern times. Instead, the temporary exhibits reveal bits and pieces, vignettes, moments of insight into the community. I started in the exhibit “As Grandmother Taught: Women, Tradition, and Plateau Art”. It held the most appeal to me and was the reason I most wanted to visit today. 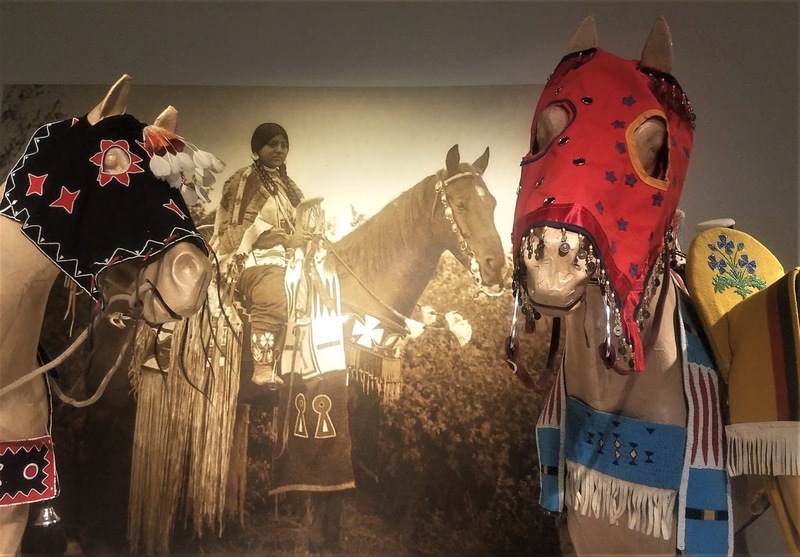 The cases held lovely examples of old and new functional items – baskets, handbags, clothing, footwear, and (interestingly) horse regalia such as saddles and head coverings. I learned about natural materials that have been used over the years to craft these items – wild cherry, red cedar bark, hide, bear grass. But, I was most impressed by the selection of black and white photographs of Native women from the late 1800’s and early 1900s. I rarely see photographs of tribal women and I’m not sure if that’s because photographs don’t exist in quantity, if they haven’t been collected by the historical institutions, or if the images that are held in collections just don’t make the cut when exhibits are being designed. Whatever the reason, I felt grateful to see their faces here – some old, some young, some stoic, some smiling and laughing, some solitary and others in groups. The image that captivated me the most was of a young woman astride a beautiful horse. She was dressed to the nines in riding pants, shawl and embellished calf-high boots; her hair was coiffed into two shining looped braids and she wore big statement earrings. Her horse was gorgeously adorned with a fancy saddle and flowery halter. The exhibit panel told me that this girl’s granddaughter is, today, an artist who specializes in saddle work. The family, I read, still has the articles of clothing that this girl wore in the photograph. I moved more quickly through the other exhibits. The Phantom Lands exhibit is an activist exhibit meant to stimulate viewers to think about the negative impacts of rapid development – dam construction and urbanization, for example. I tried to imagine the artists’ pieces in this exhibit changing or swaying an individual’s opinion about the environment. The final exhibit I visited was the photography exhibit F-64. I’ve seen Ansel Adams photography, of course, but the other artists were new for me. 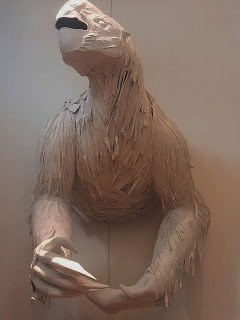 Each of the pieces was intriguing, lovely, exact, but as artistically perfect as each image was, my favorite was the photograph titled “Portrait of My Father at Age 90”. You can find the image at the Northwest Museum of Arts & Culture now or you can look it up on line at https://www.loc.gov/item/94504367/ and I think you’ll see why I loved it. 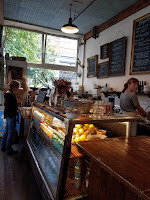 After visiting the galleries, I returned to the main floor and satisfied my less culturally inclined interests by visiting the store and the café. After browsing the shop, I sat at a small table in the far corner of the café and enjoyed an Americano while looking out the floor-to-ceiling windows at the lovely fall foliage, the rock-wall lined pathways winding toward the historic homes, the river valley below, and the tall buildings of today’s Spokane in the distance. On a sunny autumn morning, I walked down a sidewalk far from home, thinking about news my family had received a few days ago. It was sad news about my dad. Nearly unbearable. The Cancer Cloud has dogged me for two years. My brother in law, my husband, my boss, and now my father each battled cancer during that time. I’ve pulled out the umbrella and rain gear to protect against the deluge of fear, uncertainty and sadness, but still it’s been tough. At some point, our struggles eased. We went through a long period of smooth sailing. We lost count of the months and years since the last significant round of mishaps. Then, we got a call from my brother in law saying he’d received a diagnosis of late stage cancer. It was a shock after the placid waters of late. Just months after his brother’s passing, my husband was diagnosed with the same cancer, sending us to an entirely new level of persistent fear where our future plans and dreams were in peril. During the next twenty four months, I waited. I waited in the lobby of the doctor’s office, waited in the hospital’s lounge during surgeries, and waited interminably for test and treatment results. Self-help practitioners (including my favorite, Oprah) say I should practice being grateful for my fortunes and prevailing tail winds and they suggest that these disciplines improve quality of life and reduce anxiety and depression. They say these things can help a person weather the storms of life. During these waits, I tried it and it seemed to work. I kept a gratitude journal – each day scribing five positive things that had happened the day before and five things I looked forward to today. Good things began to accumulate in my journal. Five goods turned into seven and ten. The things I looked forward to mounted as well and I observed that while “bads” might happen in threes, goods happened in tens. I became a hoarder of good: I collected them hungrily - a beautiful day, a delightful row of rain-gear-clad children on their way to the park, a teenager playing his drum set at a roadside pull off, a strong run, a powerful yoga session, a new recipe with deep flavor, a positive interaction with a co-worker, the success of someone I love. The lists grew and grew and filled notebooks that filled boxes. My husband eventually made it through his rough water and just as the rapids smoothed out into a peaceful stretch of river, my boss was diagnosed with a different serious form of cancer. I reeled again from the power of this hit to someone close. Then, while the impacts of my boss’s diagnosis were still reverberating, my mom and sister took my dad to the emergency room for pain and the doctor there offered a preliminary diagnosis of lung cancer. It felt like it was just too much sadness to endure. A week later, I went to a doctor’s appointment with my parents and we heard the full explanation of what dad faced. I was confounded at the ugliness and hopelessness of it. The news made me angry, guilty, afraid. It sank into me and my own lungs felt heavy and ill. I wrenched myself away from my parents, leaving them in the middle of their third appointment that day, the doctors kind but so matter-of-fact. I had to catch a flight to Philadelphia for business and I spent the day alternately spilling tears and wracked with guilt about leaving. The morning after I arrived in Philadelphia, the sun rose. I wrote that down in my journal. Sunrise – one good thing. Dad’s doctors are caring – two. There is relief for his pain – three goods. I put my journal down and cried. I set out for a walk to calm myself. The streets were quiet and, although I tried to look for beautiful things to ease my mind, ugliness appeared instead. Beneath my feet, the cobblestone buckled where tree roots pushed upwards. Tar and gum and spittle dotted the concrete and a stench of sewage rose through the grates and caught in my throat. 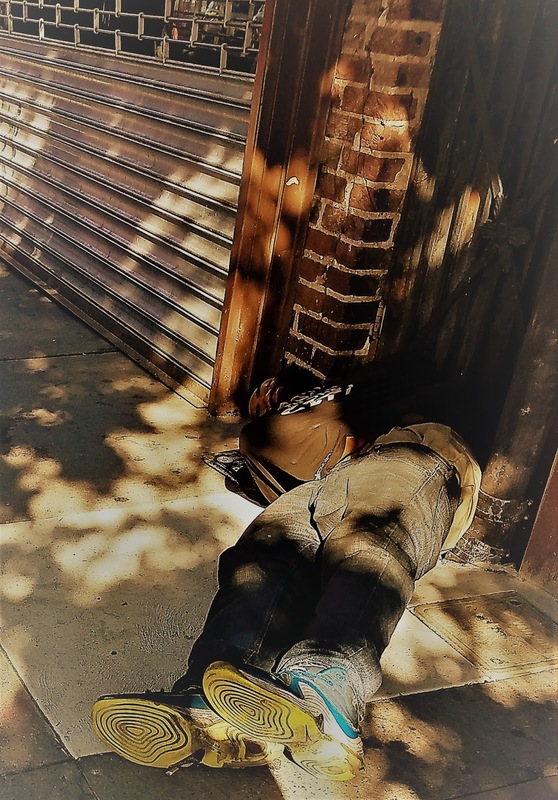 A homeless man slept in a doorway, his vertebra erupting through his taut skin and scabby wounds shining between his shoulder blades. A half-eaten pizza slice was thrown onto the ground, fodder for rats. These ugly things warrant notice, I thought. They demand attention, deliberate focus. Sadness, ugliness can’t really be ignored in a quest for good. I turned a corner and music drifted toward me from across the street, easy and quiet. The stained glass windows and front doors of the Mother Bethel African Methodist Episcopal Church were open wide and a choir inside was singing. It was a hymn I didn’t recognize and I couldn’t make out the words, but it was lovely. I sat down on the front steps and listened to the rise and fall of the voices. A few late parishioners, dressed up in Sunday clothes, hurried past me to join the congregation. I thought about the ugliness I’d just walked past this morning, noting that the coexistence of beauty and ugly are perpetual, inescapable. One doesn’t exist without the other. The beauty of this church and music, its structure and its sound, in its proximity to the dirty sidewalks, homelessness, and decay tempered, but didn’t wipe away, the abhorrent. The ugly was made bearable by the beautiful. Later, I re-opened my journal and wrote out these things as goods – my fourth and fifth for the day. 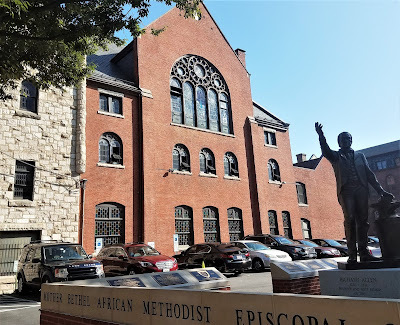 The existence of the Mother Bethel Church in a rough part of this big city and the salve of her hymns. Summer Vacation Road Trip - Western U.S.
On a clear morning in Wyoming I was startled awake by a bugle reveille echoing through the forest. “You’ve got to get up, you’ve got to get up, you’ve got to get up in the morning!” I lay in my warm sleeping bag while the boy scouts of Treasure Mountain encampment a mile upstream from our campsite rustled about and headed off to breakfast, excited for a day in the Teton Mountains. I was kind of excited, too. This was our first night out on a hastily-thrown-together backroads-backpacking-hiking trip in our country’s true west. Normally, we stay around Alaska during the summer when conditions here are prime for outdoor activities. But to date, the weather had been cold and wet and thus, we decided to jump ship and head south to join our fellow Americans on summer vacation. We put together a two week route that would take us into new-for-us national parks, forests, and wilderness areas. 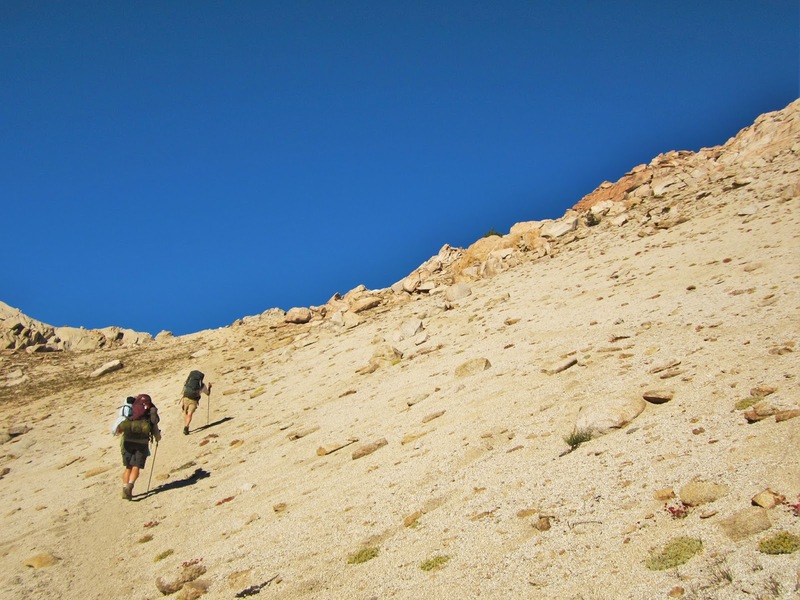 It was peak season in the Lower 48 states and while we ran into associated problems such as no vacancy signs, packed parking lots at some trailheads, and intense heat on the plains, we found mid-summer advantages counterbalanced those negatives. With a little bit of finesse, we discovered a surprising number of back doors to some of America’s most popular places and by entering through these portals, discovered solitude, beauty, and open space. Who knew there was a way to view the spectacular Tetons other than coming at them through crazy Jackson? Matt zeroed in on the Teton Canyon trailhead located along the off-the-beaten-path western flank of the range. 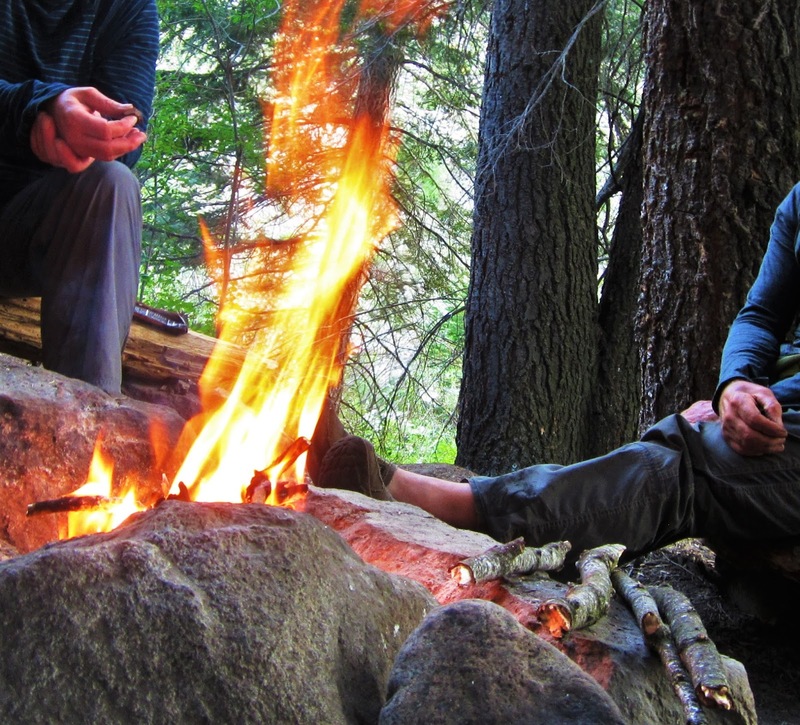 The trailhead camping and the majority of the trail itself are within Caribou-Targhee National Forest and that means fewer people than in nearby, better known, Grand Teton National Park. We snagged a “dispersed” camp site for free along the bumpy access road and then backcountry camped in Alaska Basin where permits were, likewise, not required. If we had been set on camping in the park, we would have had to drive all the way into Jackson, deal with traffic, wait in line at the ranger station, and very likely miss getting a limited entry permit anyways. 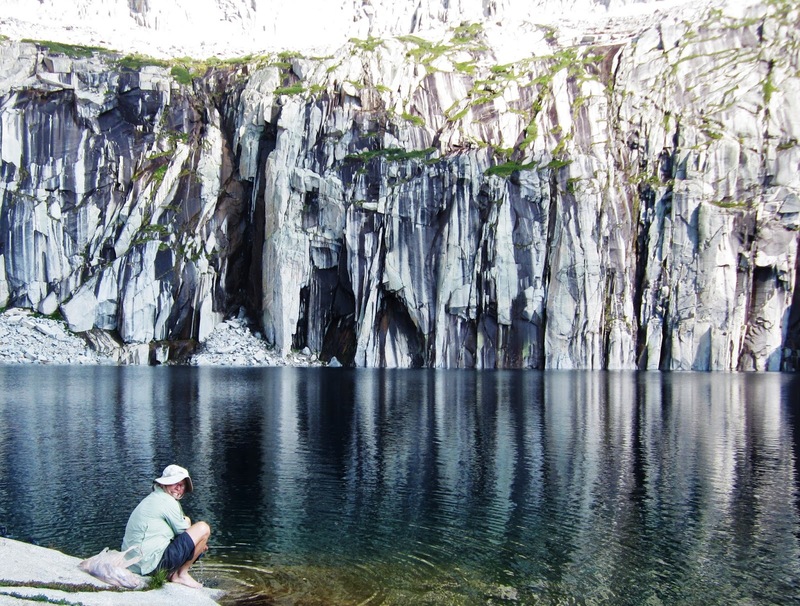 Navigating the processes in these iconic parks can be frustrating and restrictive if you’re used to more open public lands like those we frequent in Alaska. Autumn is a tumultuous and unpredictable season on Alaska’s coast. 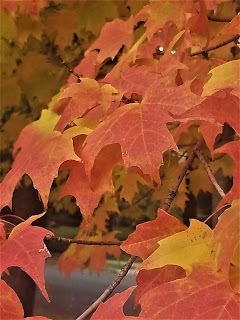 October started out inauspiciously this year with drenching rain that brought down most of our fall leaves. I wore a trench coat, umbrella, and rain boots every day that week. When the rain let up during the second week of the month, cottonwoods across town and willow thickets covering the mountain slopes were bare. But, the dissolving clouds revealed a blue sky and shimmery white rim of snow on the ridges. In the mornings, I ran under a bright moon with planets and stars hanging over the mountains as the eastern horizon glowed yellow-orange. It was dark enough to need a headlamp and cold enough to need a headband and gloves, but warm enough to get by with summer weight tights and a light jacket. I was like a steam engine, puffing along down the street. The scent of jelly donuts baking at Safeway filled the chill air. Cottonwood leaves rasped when stirred. The turn of seasons makes me hungry for comfort food – creamy, chewy, warm – and during the first half of October I put together this list to share. All of these are easy to prepare, healthful, colorful, and delicious. I hope you find comfort in them. This salad packs well for lunch, even when made the night before, and is suitable for a light dinner. The following quantities are intended for a single serving. Toss this salad together for a light standalone lunch or serve with broiled salmon. This is intended to be a single serving. Prepare the tofu by draining, slicing, then pressing between paper towels until quite dry. Heat the oil in a very hot skillet. Meanwhile, gently toss the tofu in cornstarch. When the oil is sizzling, lay tofu in single layer in the oil and fry until brown and crispy. Remove and drain. Prepare the salad by tossing together lettuce, cabbage, sunflower seeds and dressing. Top with tofu. This recipe is from Huffington Post and is a delicious, creamy healthful lunch or dinner. Serve with sweet juicy slices of navel orange. I substituted 2% milk for the half and half and reduced the quantities to 1/3 of ingredients shown to make one serving. The combination of warm creamy polenta and sweet tart fruit compote is quintessential fall comfort food. Serve for breakfast or brunch. This makes one serving. First, prepare the compote. In a small pan combine the pear, apple, raisins, sugar and spices with a small amount of water – start with 1 T and add more if the fruit begins to stick to the bottom. Cook over medium heat until very soft and saucy. Pour compote into your serving bowl, reserving liquid in the pan. Let cool while you prepare the polenta. Add enough water to the reserved cooking liquid to make 1 cup. Add polenta and cook over medium low heat until creamy. Add more water if needed to achieve your desired consistency. Scoop into the serving bowl and enjoy alongside the compote. Spaghetti squash forms a wonderful soft yet substantial base for many toppings. This combination is a delightful sweet-savory meal that packs a mild bite from the Gorgonzola. Pre-cook the squash to make preparation very fast. This is a single serving. Try enjoying with a cup of hot natural apple cider! Heat the olive oil in a small cast iron skillet over medium heat. When hot, toss in shallot slices and saute until translucent and brown. In the meantime, toss together squash threads, Gorgonzola and chopped date. Heat squash mixture in microwave oven until warm and cheese is melted. Add shallots. Mix gently but well with sea salt and pepper. Start the morning with a tangy and satisfying bowl of healthy ingredients. Heat a dry cast iron skillet until very hot. Lay mushrooms in a single layer on the hot surface and cook until browned – about 4 minutes. Turn once to brown the reverse side. Add cooking wine – it will evaporate and absorb into the mushrooms immediately. Chop and set aside. Add a smidge of oil, turn down the heat, and sauté onions until brown and sweet. Chop egg and avocado and toss with mushrooms. Combine yogurt, mustard, salt and pepper into a dressing and then toss the entire bowl to mix well. The quantities of ingredients shown below make plenty of soup to store and freeze for future meals. Serve with vegan gluten free Banana Almond-Flour Muffins at Recipe. Heat oil in a large soup pot. Add onions and cook until soft. Add spices and bullion. Mix and cook for about 1 minute. Add remaining vegetables and cook for another minute or two. Add water and lentils. Bring to boil and then reduce heat and cook for 25 – 30 minutes until all ingredients are soft. Cool and then process in a blender until smooth. Add chard when reheating is you wish! Fitness and diet management are perfect fits for technological tools. Both are based on counting and tracking numerical data and retrieving information from well-established and universally available databases. Therefore, it is no surprise that a wide range of devices, web programs, and smartphone apps designed to help us attain our health goals are now available. A few months ago, a technician at my company put together an excellent program about fitness gadgets such as Apple Watch, Samsung Gear Fit, and Fitbit. She tested and evaluated the pros and cons of each and presented this information at a community forum. It was an extremely popular presentation, attended by twenty community members trying to improve their fitness levels. It seems like everywhere I go, I encounter people wearing these devices. I am a devoted subscriber to a different family of technological solutions – web programs. The specific duo that I use is MyFitnessPal plus Samsung Health. Both offer web accounts, powerful apps, and work in synch with one another. I attribute much of my success losing fifteen pounds last year and my ability to maintain my weight afterward to MyFitnessPal (MFP). I use it so frequently and have gained such value from it that I now pay the $50 annual fee to the developer instead of just taking advantage of the free version. 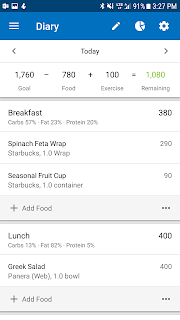 MFP is a web-based service with an associated Android/iPhone app. Once the user sets up an account, they may immediately begin using the robust features via laptop, tablet, or smartphone. 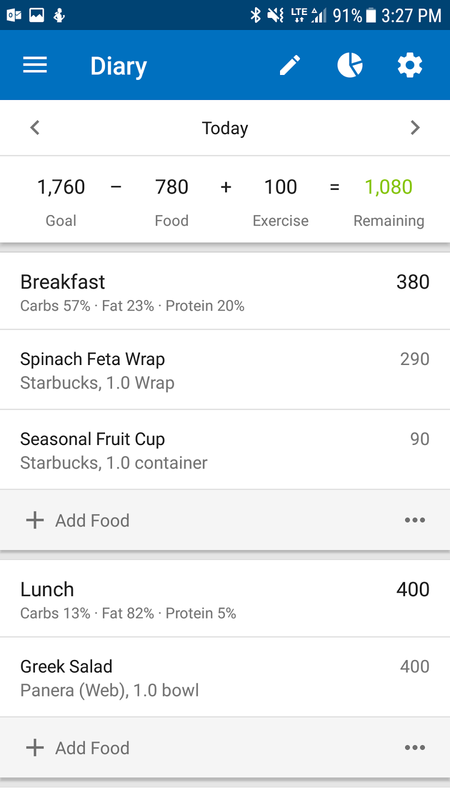 The app is my primary interface for MFP and I expect most subscribers will interact with the information through their smartphones as well. Several features make the app especially powerful for healthy weight loss and diet management. The first is that it calculates the subscriber’s daily calorie allowance by using readily available and accepted averages for gender, weight goal, height and current weight. I double-checked my calorie allotment against other resources on line and, after evaluating my own results, determined that the calorie budget is on target. MyFitnessPal is tied to a robust database which contains a phenomenal range of food products. Thus, the user may easily access nutritional information for generic raw ingredients along with niche brands and restaurant meals. I recently searched for a snack I purchased in a hotel lobby called a “BudiBar” (I’d never heard of it before) and it popped up instantaneously displaying nutritional contents that matched the product’s label. The database contains entire menus from restaurant chains – even regional chains. Last week I ordered dinner at Chipotle and was able to select each of the components for the bowl – down to the specific type of salsa, beans, and rice. The database allows users to select the specific quantity consumed for each item in units including grams, ounces, cups, and tablespoons. The daily food diary is intuitive and easy to use. The user may scroll back and forth between days, copy meals from one day to the next, set up frequently eaten foods, create recipes, and more. If desired, the premium on-line version allows the user to download and print their history for tracking or analysis. This could be especially useful if working with a dietitian, physician, or coach. Lastly, MFP provides a field into which the user enters their exercise for the day. The calories burned are then recorded as a net add in the daily calorie journal. make informed decisions when selecting food. The magic of MFP is that the features and methodology built into the program reinforce the concept of a calorie “budget”. The user starts each day with a set number of calories. Then, the user “spends” those calories over the course of the day to power (or “fund”) their body’s functions and activities. The food diary is like a “check register”, into which the user enters each meal and the calories are deducted. The user watches the calorie balance decrease over the course of the day. If the user exercises, calories are “deposited” back into the account and the balance increases. Voila – instant gratification in the form of more calories to eat! MFP’s real potential for helping users improve their health is when one starts to play around with the allocation of calories between “buckets”. In financial management, this is like putting more money in the rent budget by taking money out of the entertainment budget. With MFP, the user moves calories among protein, carbohydrate and fat buckets to hit optimal targets for each. Therefore, MFP allows the user to micromanage their own diet to the degree desired: One may monitor calories only, macro nutrients, or manage nutrient intake down to milligrams of calcium, iron, types of fat, sugars, and vitamins. I recently began using the Samsung Health app that came on my new Galaxy 7 phone. The app is synced with MyFitnessPal and I set it up to track running and walking – my two most common forms of exercise. Now, when I walk or run (as long as I am carrying my phone), my steps automatically populate MyFitnessPal diary and then MFP calculates the calories burned and adds those back into that day’s calorie budget. So far, the app accurately and automatically detects when I start and end a walking or running session and appears to successfully differentiate between walking and running - I don’t have to activate or deactivate the app for each session nor do I have to tell it which activity I am engaged in. As with most software, there are many other features that an individual might choose to utilize. MFP, for example, has an excellent blog with short articles, practical and creative recipes, and quick guidance on workouts. Samsung Health accesses a wider range of articles from news sources about health topics and offers a heart rate monitor. These two programs work together seamlessly and provide the user with powerful capabilities to achieve and maintain individual wellness goals. 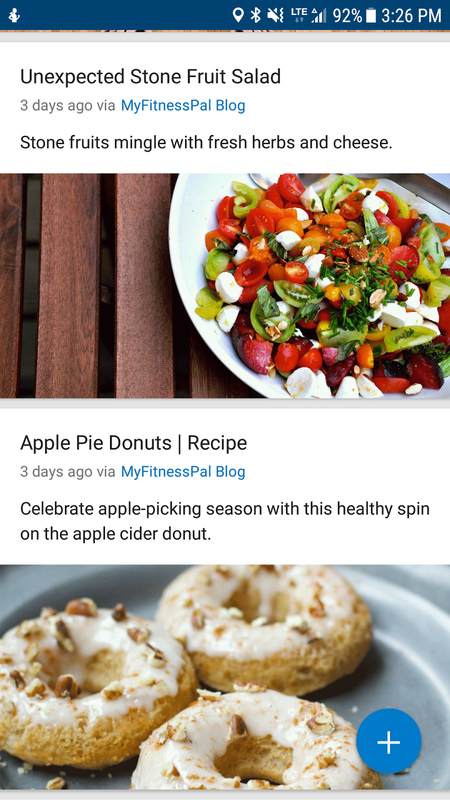 The excellent MyFitnessPal blog offers creative, scalable, fast recipes. I highly recommend digging into these next generation diet and fitness tools because they provide much needed accuracy and ease for those of us wanting to improve our health. I like it. Sorry, but I do. It’s big, lit up in blue and you can't miss it. The new City of Valdez Welcome Arch at the intersection of Egan and Chitina. Photo by Matt Kinney. As with nearly every public project, the new City of Valdez welcome sign was controversial and generated much discussion at City Council meetings and over coffee pots and water coolers across town this summer. Angst over the sign especially heated up after it was announced that the sign would cost much more than anticipated. I get it. We spent a lot of money to buy a sign. Yet, now that the bill has been paid and it’s done (Mayor Ruth E. Knight flipped the switch in October), it’s time to enjoy it. The sign is more than a stand-alone project. It's really just one component in a large scale, multi-year redecorating plan. 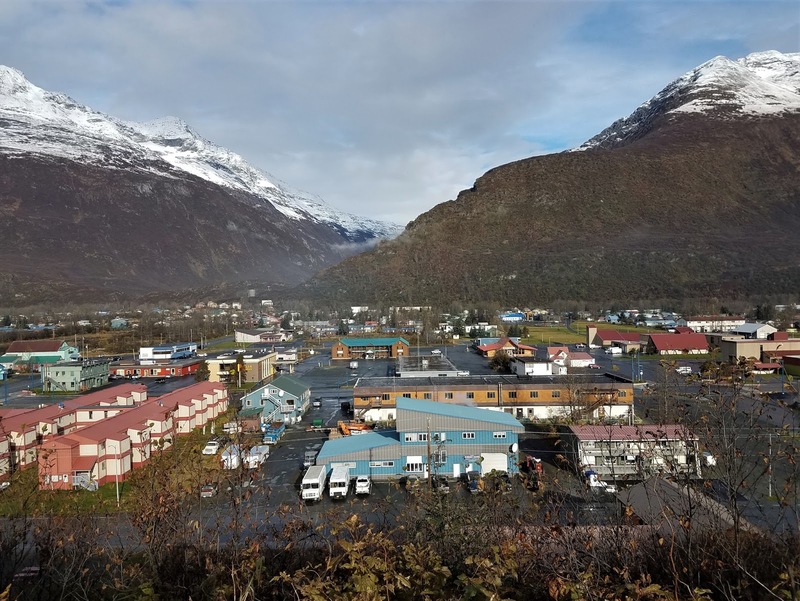 Much like an individual who undertakes a project to redecorate their house, the City of Valdez Beautification Task Force has been working for a number of years to spruce up the town. I’m not on the Task Force and have kept up on its activities only peripherally, but let me take a stab at why they're doing this. I think it’s because people live here (unlike Deadhorse where folks fly in, work, then fly out again). And, people generally like to live in places that are homey, welcoming, clean, comfortable, well lit, and have some elements of beauty, art, or visual interest. Judging by the appearance of most homes, we Valdezans fit into this generality. Nearly every home in our community – be it a mobile home or a custom built home —is well kept. Lawns are mowed, houses painted to the best ability of the resident, flowers abound in the summer. For the most part, residents appear to place value on aesthetics, not just function. The projects that have emerged from the City’s beautification initiative help make town look and feel like a place we might want to stay a while. We can, and do, make other arguments to support beautification so that the funding and time spent on it can be better justified – it’s good for tourism, for example—but in the end these projects are for us. One of the first notable beautification projects was to improve the small boat harbor: board walks, fish cutouts mounted on posts, sidewalks sporting fish imprints, and restructured parking. Next came the creation of pocket plazas with benches, garbage cans, and historical interpretive signs. Then the improvements to the city dock – including the “Pringle” (some call it a potato chip) which is used regularly to shelter community music and sports events. Along with these projects, the City upgraded several parks, including extending the civic center hill trail, adding the adorable and well-used pirate themed playground on the park strip, and improving Ruth Pond. The Egan Street project is the latest and includes, but is not limited to, the welcome sign. Along with the sign, the City improved sidewalks, expanded pocket plazas at intersections, constructed large built-in planters, and installed decorative street lights. All summer, I heard complaints about the project (granted, many of us had construction fatigue in general from all the work being done around Valdez): how would snow plows possibly get around these new design features without damaging them or the equipment? How expensive and time consuming will it be to maintain these things? Won’t the sign blow down and/or will snow build up on it and damage it? Do we really need so many lights – isn’t it overkill? It’s so expensive –shouldn’t we spend the money on other things? I used to work at the museum where, because of my position and the role of the museum as an important cultural institution, residents would frequently complain to me about our town’s lack of character. People would admonish me and the board to do something, suggesting things like promoting facades on all the businesses along main street to hearken back to the gold rush days or require business owners to paint or display flowers. Anything, residents seemed to say, that would elevate the look and feel of our town above utility. The improvements on Egan are nice, but in actuality, they are minimal and low impact as municipal beautification goes. The City Council didn’t pass an ordinance requiring business owners to put gold rush facades on their buildings. They didn’t ban the shipping containers that so many businesses use for storage. They didn’t increase taxes to pay for maintenance. Maybe there will be problems with some of the new features: maybe the light bulbs will burn out and have to be replaced, maybe a plow will put a ding in a planter, maybe the welcome sign will need shoring up. I think we can figure out how to deal with these things. a welcome improvement for walkers and runners now that it's winter. Photo by Matt Kinney. I like to run and often do so in the mornings before heading to work. The week after the welcome sign was unveiled and the new street lights were electrified, I took a circuitous run through town. I ran along the bike trail behind the Senior Center where alders were fading and grass was golden. I continued on down the bike trail along the Duck Flats, then turned and ran along the boat harbor where seagulls watched over the vessels resting in their slips. I jogged on toward the John Kelsey Dock, past peaceful Ruth Park and looped under the Pringle. Then I headed up toward Egan Drive. I turned onto Egan and was delighted by the cleanly defined corridor created by the neat rows of blue-green light posts. The decorative hooded fixtures created an attractive border for our main street. I trotted along, checking out the nice designs on the new walls of the planters, imagining the greenery that will appear in them next spring. Then, finally, I ran alongside the welcome sign. It’s contemporary, made of steel, and stylized mountains stretch across the arch. In bold font, it reads “Valdez Alaska”. Taken with all of the other pleasant design elements that are now pieced together throughout our community, I turned and gave it a thumbs up. Two days into a backpacking trip that would take Matt, Bonnie, and I over three mountain passes, across 43 miles of Sierra Nevada wilderness, and to a high point of 11,400’ I reached a physical and psychological equilibrium. Daily climbs up long series of switchbacks taxed my heart, lungs, quads, and calves and the subsequent descents into valleys strained my core and punished my feet. Yet, overall, my energy level was high. My meal planning was paying off. in Sequoia-Kings Canyon National Park. Over the past several weeks, I had planned out meals and snacks for this trip and, more than for any previous backpacking adventure, I had tried to take a strategic approach, thinking primarily in terms of packing in enough calories to power six days of high level hiking. 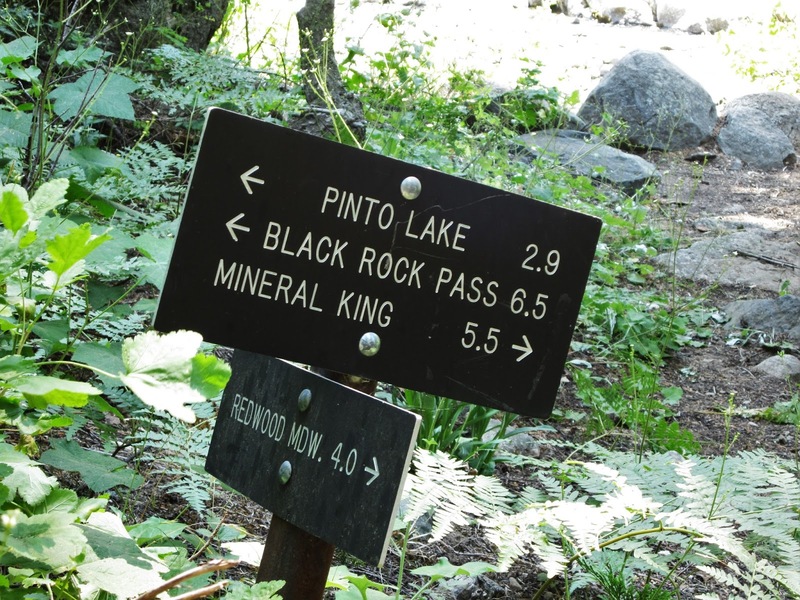 The trip we were on started at 7,500’ at the end of the Mineral King Road in California’s Sequoia-Kings Canyon National Park. 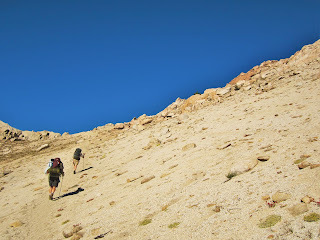 Although the trails were well maintained, therefore not as taxing as backpacking in the untrodden backcountry where we often find ourselves, the hiking did require non-stop calorie-zapping exertion from the moment we jostled our packs on and took the morning’s first step to when we’d set up camp. I estimated that I burned between 4,000 and 5,500 calories per day, hiking between 5 and 8 ½ hours. I planned to consume 2,500 to 3,000 calories each day to try to keep up with the energy demand. This number of daily calories was far in excess of what Matt and I normally consume on shorter trips (typically we eat 1500 calories daily, less than I take in on a day of computer work). Calorie count was my priority, but I also considered several other factors. I tried to include food that would stimulate my appetite, since a high level of exertion combined with hot weather tends to suppress my appetite. For example, I tried to incorporate a variety of tastes and textures – difficult to do with foods that will pack well and last for six days. Additionally, I paid attention to weight and volume. We wanted to get by with carrying one large bear canister for three people and that would be a stretch, even though we took advantage of on-trail food lockers at our first two campsites. 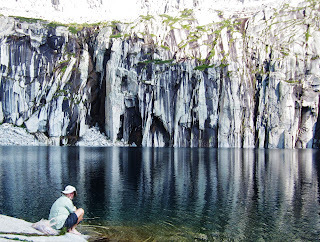 Finally, I looked for creative twists to enliven our menu – Matt and I have backpacked together since 1996 and have rarely changed up our backcountry menu. I wanted to try something new on this outing. Following is the menu I followed. At the end, I’ve included reviews and notes. Please keep in mind the calorie counts and expenditures in this article are based on package information, commonly available on-line tools, and My Fitness Pal app. instant coffee (individual packets) for after dinner treat. Indian Vegetable Korma dinner with croutons. 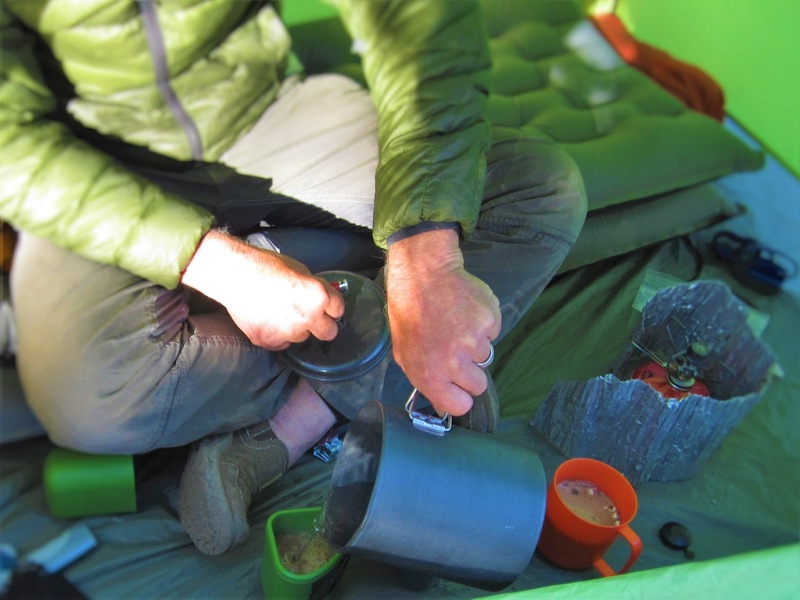 dehydrated dinners and cold granola into the menu. Breakfast – No appetite, sick of Clif Bars! Dinner: Celebratory Dinner in Visalia! Apples: Apples are bulky, but it’s worth giving up some of your pack space in order to have something fresh on the trail. Apples also produce less waste than, say, an orange. Of all the fruit we’ve tried carrying, apples are the most resilient and long lasting. Our hiking partner, Bonnie, had an apple in her pack on the fifth day of this trip – it was a little worn, but still tasted fine. Cheese: Be careful of taking cheese on the trail – particularly in warm weather. We had good luck with a chunk of white cheddar that we packed in for dinner on our first night, but don’t expect most cheese to last longer than that. That said, I took several rounds of Baby Bell white cheese packaged in wax. These lasted very well for four days, and I’d guess they’d last longer than that. Clif Bar: Though I eventually get tired of eating Clif Bars, they are high calorie, come in a wide range of flavors and contain organic ingredients. I especially like Blueberry Crisp, Banana Nut Bread, Chocolate Brownie, Crunchy Peanut Butter, and Oatmeal Raisin Walnut. Croutons: The store bought croutons packed surprisingly well and added welcome crunch to a dehydrated dinner. They did not get crushed in the bear canister. Gatorade: I alternated between preparing Gatorade in my Camelback bladder at night and drinking it on the trail during the first few hours of the morning hike and preparing and consuming it later in the day. I found it gave me a needed power boost in the afternoon and especially noticed it kicking in if I drank a substantial amount (such as 8 to 16 prepared ounces) along with a GU energy gel before starting up a session of switchbacks. We used powdered Gatorade. Although the Sierra Nevada water is lovely and pure, in other parts of the country Gatorade helps mask off-tasting water. Granola: A cold granola breakfast is a great alternative to hot oatmeal. It’s sweet, contains substantial fat and is quick to prepare if you are trying to get an early start on the trail. I pre-mixed 1 cup of granola with ¼ cup of powdered milk in individual plastic baggies. In the morning, I placed the baggie in my mug, added water to the baggie, and ate out of the baggie. This meant no clean up. GU: Gu has been my go-to energy gel for years. The packets are small and I believe they give me a power boost. They are sticky-messy if you’re not careful! The flavor and texture reminds me of a cross between pudding and cake frosting. Although Gu comes in a wide range of odd flavors, I typically stick with vanilla and chocolate. 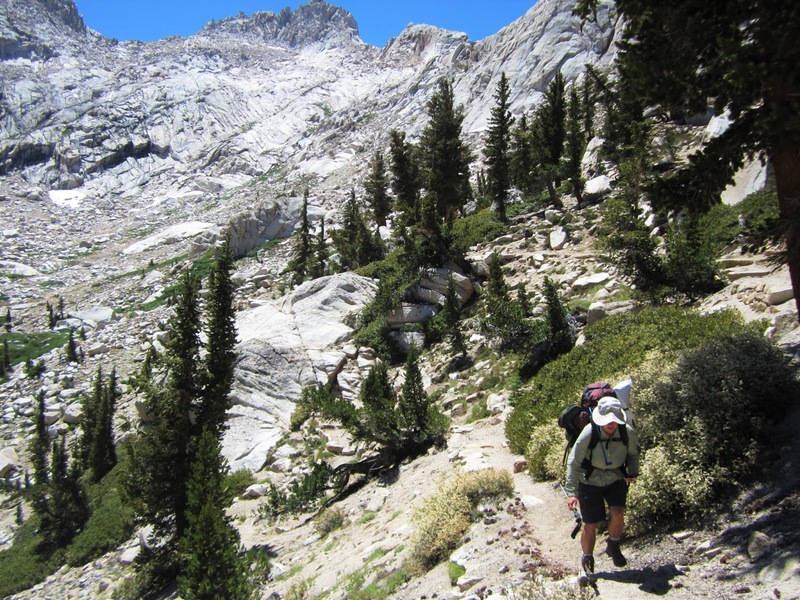 Orchard Bars: Our traditional backpacking power bar has long been the Clif Bar. However, on long trips I lose my appetite for them eventually and get to the point where I can’t stomach the idea of another one. On this trip, I tried the Orchard Bar, which contains fewer calories, but offers a very different (welcome) flavor and texture. Orchard Bars are gooey, super sweet, and fruity-tart. I find them in the produce section of Safeway. ProBar: I ate one of Matt’s ProBars on the last day of the trip and enjoyed it. It’s high calorie compared to other power bars and was sweet and crunchy (I had the Cookie Dough flavor) – similar to a rice crispy treat. It also has a high protein content compared to other bars. Smoked Salmon: The SeaBear smoked salmon I took turned out to be messy (oily). I’d highly recommend the flavor of smoked salmon for the trail (salty, delicious), but I’d go with a jerky instead. Perhaps try Trader Joe’s wild salmon jerky. Tortillas: 100% whole wheat tortillas were a great addition to our menu. Tortillas are relatively high calorie for the amount of space and weight they take up. They form beautifully to the outer wall of the bear canisters and last surprisingly well in warm conditions. They are a nice fresh addition to a dehydrated chili or curry dinner. They’d be great for breakfast as well with nut butter. Dehydrated Dinners: I decided on this trip to go all-in and rely on dehydrated dinners. The last time Matt and I tried dehydrated food was ten years ago and the taste and consistency was so horrible we swore we’d never eat them again. 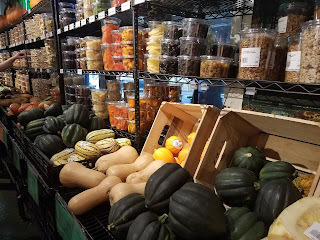 However, when I started shopping for this trip, I discovered a new range of vendors had popped up selling gourmet, vegan, vegetarian, gluten-free, and otherwise fancy-schmancy dehydrated backpacker food. Among them are Alpine Aire, Outdoor Herbivore, Backcountry Pantry, and Good to Go. The old standard, Mountain House, is also still around. The flavor and variety has vastly improved and I’d recommend these. The benefit of the dehydrated food is primarily that it’s pre-made, so it’s easy to prepare, and doesn’t require as much fuel as other options. You just bring water to boil, pour it into the bag, seal it, wait, and eat. The down side to these meals is that they are bulky to carry and the used empty package is also bulky. Note that at high elevations (such as the elevations at which we hiked this entire trip) requires doubling the soak time of all the meals. We waited between 20 and 40 minutes for the dinners to reconstitute – that’s long enough to cool off. We emptied the reconstituted dinners into our cook pot and reheated for just a few minutes before serving. I’d highly recommend bringing along ingredients to supplement the dinners. For example, try cheese, tortillas and croutons. One last note, make sure to stir up and crunch up (with your fingers if necessary) the dry food before adding water. Then, make sure to mix well with the water or you’ll end up with pockets of dry unhydrated foods in the corners and on the bottom. Take a long handled spoon to mix – the packages are deeper than the typical camp spoon. Backpacker’s Pantry: The food was very good and we liked the flavors and consistency of both the Charros Beans & Rice and the Vegetable Lasagna. However, the company needs to work on the package seals – they were hard to get closed. Good to Go: The Indian Korma we tried was my favorite meal of the trip. The seasonings were fantastic and strong and the beans tasted and looked almost “real”. Mountain House: The dinner we tried was fine, but was the least favorite of the dinners for all of us. The flavor was adequate, but the dinner was less filling and the quantities didn’t seem as substantial as the others. Alpine Aire: We liked the Mountain Chili, but it took a long time to reconstitute (40 minutes at high elevation). Nonetheless, I’d recommend this dinner. Outdoor Herbivore: While the Waldorf Salad wasn’t my favorite of the dehydrated foods we sampled, I’d definitely eat it again. It was a nice treat to have something to mix and eat for lunch on the trail. Depending on the source of your water, the salad comes out almost cold. It would also be good for breakfast or as a side dish for dinner. Outdoor Herbivore makes a couple of other salads that I’ll eventually try. Follow the instructions carefully and measure the amount of water. I guessed at the amount and the sauce came out a little watery. As a side note, we tried a couple of other dinners (Lickety-Split Lentils) for car camping later on the same vacation and they were also good.